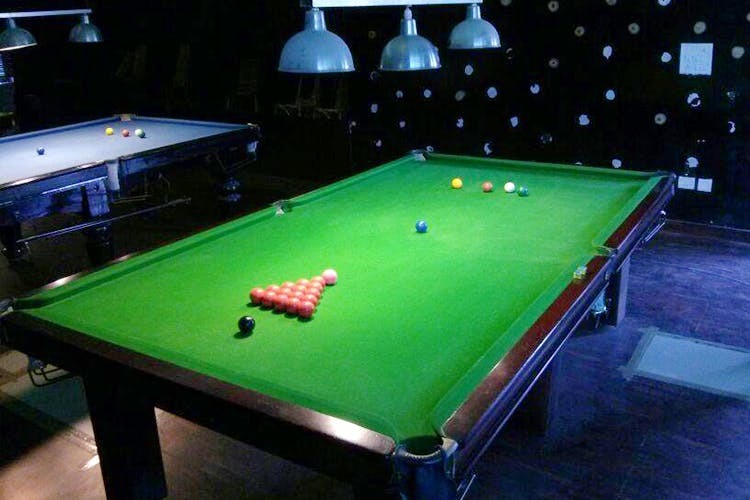 The Corner Pot is BTM’s lesser-known hangout spot for you and your squad to chill over a game of pool, snooker or billiards. Serious pool players, it’s your go-to spot too. Hangout spots in BTM Layout are much lesser when you compare it to its nearest neighbour, Koramangala. But that doesn’t stop it from having a hangout scene such as the rooftop cafe, Ruh’s Cafe, and PHEW, where you can play board games and sort. Adding to that scene is The Corner Pot, a space dedicated to just pool and all its variants. Open all through the week, it’s your adda to hang out if you are looking for doing something fun with your squad. And by fun we, of course, mean, pocketing the black before your friend does. Or racking up points while trying your hand at snooker. In any case, it’s pool time, guys! Three tables, American, English, and French are there for you and your gang to book. If the crowd’s heavy, which is generally on late weekdays and weekends, get yourself a post by the foosball table. Score a few goals as you wait for your turn or you could just call in advance and book yourself a table. That’s perfect if you are planning on staying for a longer period. Hourly rates start at INR 140 for the tables with INR 100 per hour for foosball. While there’s no cafe or anything for you to order food from while you are playing, the folks of The Corner Pot can help you out with placing orders from nearby cafes. You can order yourself some puffs and soft butter bun snacks from Disney Cafe, that’s just a hop, skip, and jump away from the place.